Astrogeographical position for the Capital of North Korea Pyongyang for morphogenetic field level 1 which defines the international, supraregional topics, energetical situation and resonance of the North Korean government: the resonating degrees that define the international role and position of North Korean governments are 21° in highly magnetic, centralistic, royal fire sign Leo and 9° in highly alert, dynamic male fire sign fire sign Aries the sign of speed, action, ignition and warfare. The role of self centered Leo the sign of the sun and the absolutistic appeal of rulers can be interpreted as an aspect that supports the extremely centralistic, royalistic dictatorship of the Kim Il-sung family over the country since its foundation in 1948. The combination of Leo with Aries the sign of quick action and warfare can be concluded to support the unwillingness of the “royal” family to compromise through sharing power with other institutions. Together with several Arab countries North Korea remains one of the few countries on the planet where qualification for political rulership by birth is still practiced. The most important country here is Saudi Arabia with its capital Riyadh having both astrogeographical coordinates in Leo one of which lies on 21° Leo and exactly on the same degree as Pyongyang. A different and in this context maybe surprising example of the dominant role of the presidential office over the democracic institutions and the people`s concerns is the USA whose capital Washington has one coordinate at 27°Leo. 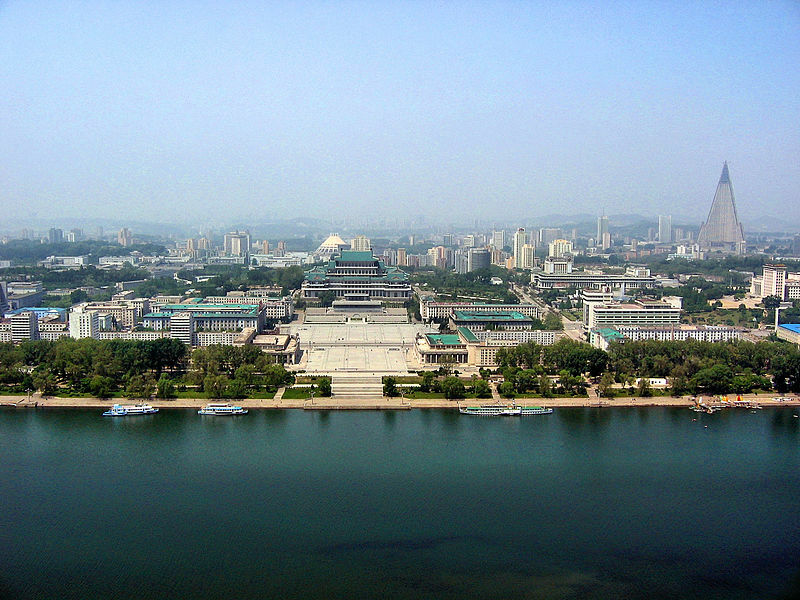 The proclamation of the People´s Republic of North Korea saw a Mercury – Neptune conjunction opposite the 9°Aries astrogeographical position of its capital Pyongyang and of its government. That really challenging and weakening transit reflects the fact that the decision of the WW2 allies to divide the country into two halves along the 38th parallel had left it in a highly dependent position. That conjunction being in Libra the sign of chinese culture reflects the fact that apart from the strong influence of the USSR North Korea played also an important role for the chinese sphere of interest ever since its foundation. And it is a clearest hint the hidden and indirect influence and manipulation of North Korean politics through the influence from Beijing. Chiron the ruler of strategical planning (Virgo) on 20°Scorpio occupied the exact square position to Pyongyang`s 21° Leo astrogeographical position in an aspect of high tension which reveals the economical dependence and the tight situation of a country that was stuck between the communist and capitalist global players. Kim Il-sung the founder of the ruling dynasty of the Kim`s in North Korea was made Supreme Commander of the Korean People’s Army on 4 July 1950 which made him the most powerful person in the country with Mars at 9°Libra in opposition to Pyongyang`s 9°Aries position a transit which explains the heavy violent threat exerted onto Pyongyang by the Russian supporters of Kim Yong Un. This pressure is even more strongly emphasized by the conjunction of the Sun at 11° Cancer and conjunct the astrogeographic position of Moscow (12°CAN) together with the Uranus (5°CAN) – Mercury (3°CAN) conjunction. Kim Jong-il (born 16. Februar 1941 in Wjatskoje, USSR) was made the Supreme Commander of the Korean People’s Army on 9 April 1993 with a Moon-Pluto conjunction at 25° Scorpio in a position 4° past the exact square to the 21°Leo astrogeographic position of Pyongyang. Kim Yong-un the current dictator and son of Kim Jong-il was inaugurated on 29 December 2011 with an exact Sun and Pluto conjunction at 7°Capricorn approaching the exact square position to Pyongyang`s 9°Aries astrogeographical position. The constellation reveals the extreme pressure, hierarchy and threat exacted by the person of Kim Jong-un onto the capital and the country. While I`m writing this article in March 2017 Uranus at 22°Aries is finally moving away from the exact trine to the 21°Leo astrogeographic position of Pyongyjang which appears to have triggered the boosting of and boasting with the country`s program for developing and testing missiles during the last 2 years or so. The next really important period will be Uranus` transit in a square to the Pyongyang 21° Leo position between April 2023 (18°Taurus) and March 2025 (24°Taurus). This transit represents the most intense challenge to the North Korean government as the support from the Chinese and Russian allies is in question through Uranus in Taurus. As the ruler of Aquarius Uranus transit through Taurus stands for the urge of larger parts of society to participate in the country`s economical development and growth. Neptune`s transit over the 9°Aries position of Pyongyang is to be evaluated as regulative and strengthening for the country but weakening for the ruling class. This is partly because Neptune as the ruler of the 12th sign from Aries represents a factor not naturally easy to understand and even much less to be controlled from a point of view of a place in Aries. That transit will be initiated in April 2028 and be effective until April 2029. As in the case of Neptune´s transit conjunct the astrogeographical position of Berlin during WW2 the transit could accompany the extremest delusion of the population and even the intentional destruction of the country. Saturn`s transit over 9° Capricorn the square position to Pyongyang is the next chance for the United Nations and particularly for China and Russia to come to a reasonable agreement with the North Korean government in regard of the limitation of its hyperaggressive foreign politics. The transit will be first triggered in March 2018 and be effective until January 2019. Astrogeographical position for the Capital of South Korea Seoul for morphogenetic field level 1 which defines the international, supraregional topics, energetical situation and resonance of the South Korean government: the presidential area in Seoul is located at 28° in self-protective earth sign Virgo sign of strategical planning and optimal use of ressources and 23° in highly alert, dynamic, male fire sign Aries the sign of speed, action, ignition and warfare. 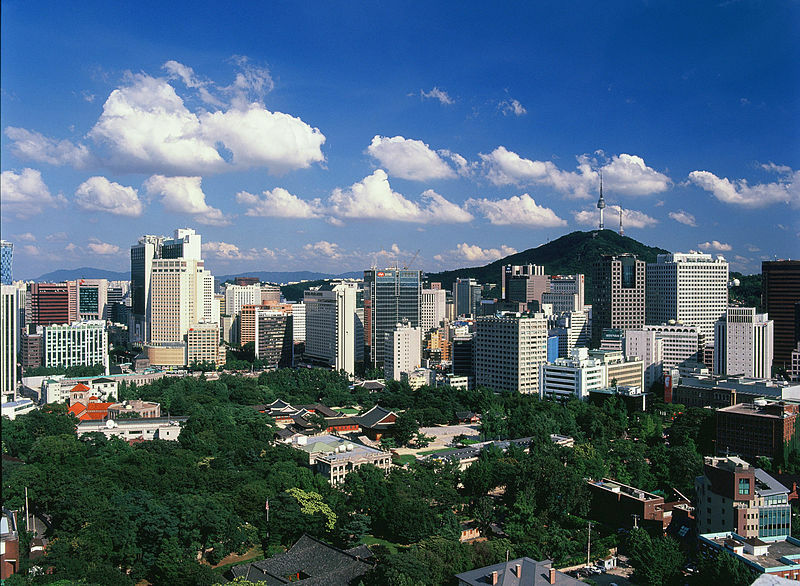 The astrogeographical position of the South Korean capital at 28°Virgo falls on the same degree as Berlin capital of Germany. Both countries were divided by the Iron Curtain between the socialist and capitalist global spheres after WW2. Another parallel is the extreme economical growth both contries experienced since their foundations in 1948 and 1949 respectively. The foundation of the Republic of Korea in South Korea was accompanied by a conjunction of the Sun at 22°Leo with Mercury and Saturn at 25°Leo in a highly stimulative and harmonious trine to Seoul`s astrogeographical position at 23°Aries. The Mercury-Saturn conjunction the clearest aspect of separation, rejection and divorce stood for the decision to leave the option of a unification of the two Korean occupation zones and the Korean nation behind. In addition Jupiter`s trine position to these highly stimulative aspects from 19° Sagittarius was a highly promising factor pointing at the huge potentials for economical growth that led to the Miracle on the Han River. The reason that I`m writing this article in March 2017 is that the US has just started deploying their advanced Thaad Antimissile System in South Korea after the newest South Korean missile demonstration of 4 March 2017. The missile demonstration was apparently carried out to emphasize the country`s strength in a situation of high tension between North Korea and Malaysia after the murder of Kim Jong Nam by North Korean agents in Kuala Lumpur on 13 February 2017. This tense situation comes during the transit of Uranus over Seoul and shortly before Pluto`s square to the capital`s astrogeographic position at 23° Aries. Uranus is currently in the process of transiting the 23°Aries astrogeographical position of the South Korean capital. This transit of reorganization and self finding was initiated in May 2016 and will last until February 2018. The mounting pressure exerted by the North Korean government on the South Korean borders,Japan and the USA with the threat of their nuclear weapons systems coming particularly during the transit of Uranus over the capital has several effects: First of all it “steals” the Uranus aspect of self.emancipation within the country`s own society by the pressure exerted from abroad. Such pressure allows little space for a revolution or self-finding process within the South Korean society. Secondly it provides the scenario and most intense danger of a nuclear war one could imagine. Wether or not we believe that Uranium and radioactivity are direct analogies of Uranus it is a fact that Uranus` transit over Seoul is accompanied by a new climax of threat of a nuclear strike by North Korea. Pluto`s transit over 23° Capricorn and in a square to Seoul`s astrogeographic position at 23°Aries will be first triggered between March and May 2018 when Pluto reaches 21°Capricorn. After a retrograde phase it will be effective from January 2019 until January 2022. Pluto`s transit in Capricorn the 10th sign and house from Aries stands for a situation in which the South Korean government can be expected to be under pressure through the Pluto aspects of the North Korean government as reflected in the Sun-Pluto conjunction during the Kim Yong-un inauguration. Generally Pluto in the 10th house stands for inevitable situations, foreign rule and the rule of dogma and propaganda to an extent that allows no space for self-determination. The climax of that Pluto transit will certainly be reached on the day of the Saturn-Pluto conjunction at 22°46 Capricorn in exact square to the South Korean government of 13 January 2020. The fundamental impact of that constellation will be even more intensified through the company of the Sun on 22° and Mercury on 23° Capricorn. But at the same time Mercury as the planet of negotiations and the Sun as the planet of life suggest the need and also the possibility to come to a stable agreement that allows a peaceful coexistence or else the unification of the two Korean Republics. 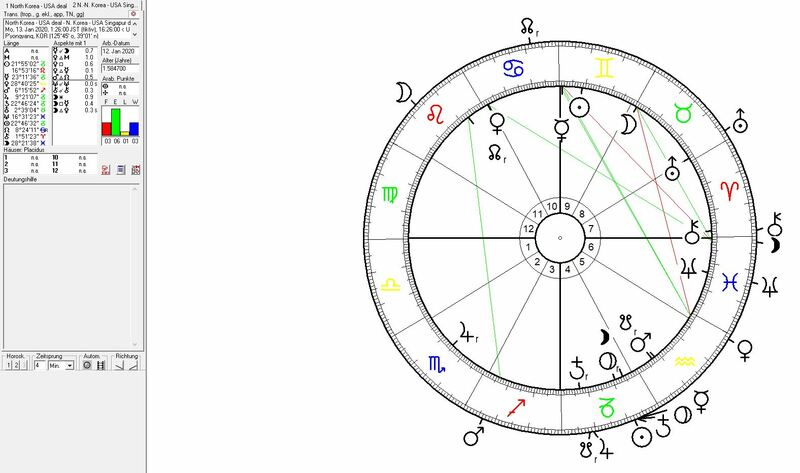 Astrological chart for the Fall of the Berlin Wall on November, 9 1989, 21:20 with Saturn conjunct Neptun at 10° Capricorn in direct opposition to the astrogeographic position of the german Capital at 10° Cancer and Jupiter at 10°Cancer conjunct the astrogeographic position. 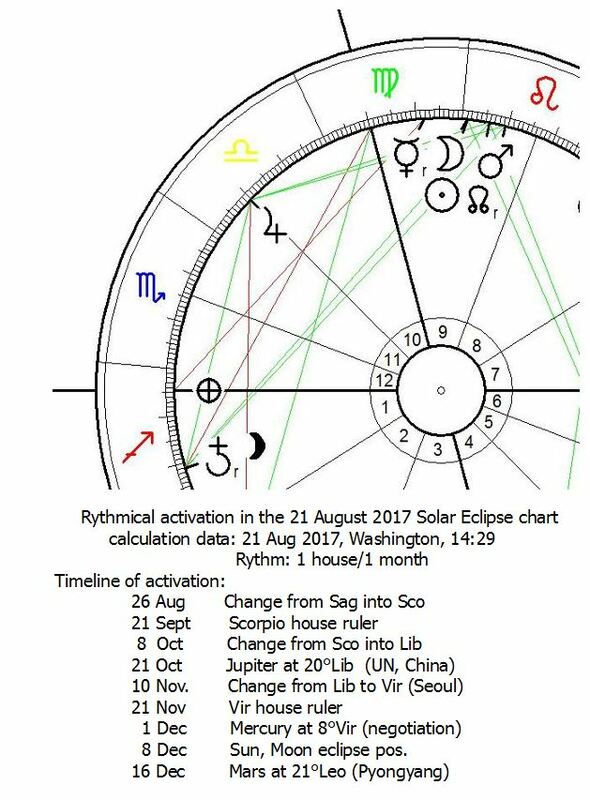 The Sun was conjunct Mercury and Pluto just as it will be during the “Korean Wall” Saturn – Pluto conjunction on 13. January 2020. Really fascinating for me is that Jupiter at 9° Capricorn will be conjunct the exact position of the Saturn – Neptune conjunction during the Fall of the Berlin Wall on 9 November 1989 which marked the end of the Cold War in Europe while this healing transit of Jupiter over that position could mark the end of the Cold War in Asia too. The resonance with the 1989 Saturn-Neptune conjunction is also remarkable because it was the cycle of Saturn -Neptune conjunctions which marked the major steps in the development of communism right from the start of the Russian revolution to the Fall of the Berlin Wall. The Singapur Deal The Singapur Deal compared to the Saturn – Pluto conjunction of 13 January 2020 which so strongly resembles the Fall of the Berlin Wall constellation of November 1989. I proposed the option of a Korean unification as early as March 2017 on the basis of my astrogeographical findings in my article:”The Astrogeographical Positions of Pyongyang and Seoul” The singapur Deal was signed with Saturn square to Pyongyang The Singapur Deal signed by US President Donald Trump and North Korean dictator Kim Yong Un on 12 June 2018 was prepared and signed during the square transit of Saturn to the astrogeographical position of Pyongyang at 9°Aries which acompanied the strongest ever sanctions against Pyongayang and Trumps politic to buy Russian and Chinese consent over the Korean situation which led to Pyongyang`s nearly complete isolation. It has to be assumed that the US President had to make a major deal with China and Russia the US enemies in the Korean war to buy their consent for his step to achieve a treaty with North Korea. The Moon position of the signing of the Singapur deal on the highly profitable degree of 29° Taurus stands for the economical cooperation between the 3 superpowers that made this deal possible. As this Moon position was exactly square the astrogeographical coordinate of Washington at 27°Leo the highest fincancial contribution must definitely have been guaranteed by the US government. The coming Sun-Saturn-Pluto-Mercury conjunction of 13 January 2020 will take place right on the Pluto position of the Singapur deal at 20°Capricorn. This constellation may have an effect like a seal that could serve to stabilize the achievements of the Trump-Kim Singapur Deal.